The Nevis Ensemble, August 8. For those who remember the Ricciotti Ensemble’s performance last year, we had great news! The Nevis Ensemble is a Scottish incarnation! 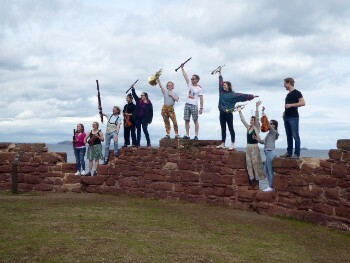 Some of the musicians, including the tenor Jamie Munn, have formed their own Scottish version and returned to Dunbar! Great performance. A full house and maybe coming next year, too? In 2019, they wish to play their instruments in the Rowing Club's skiffs whilst floating in the harbour.